Inspect your plastics, if they are scratched or have major damage it may be worth looking into replacing them. Before applying your Fresh Moto graphics, your dirt bike plastics should be in a good to excellent condition. 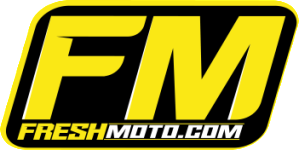 If you need new plastics, send an email to orders@freshmoto.com, We can order them for you. Wash your hands. It is very important to have clean hands while you are preparing the surface and working with graphics. Oil and dirt will reduce the ability of your graphics to adhere to the plastics. When installing your graphics, make sure that you are starting with a clean surface. Remove your old graphics – You can use a hair dryer or heat gun to warm them up for easier removal. Pull old graphics off at a 90 degree angle. Make sure you don’t leave any glue, oils or dirt on your plastics. Even when the plastics are brand new, it is necessary to wipe down the area with rubbing alcohol to get any mold release off before you install. We recommend you apply your graphics in a warm environment. If you’re applying in a cold environment, warm the plastics and graphics up with a heat gun or hair dryer before applying. Be sure to hold the heat 10 to 12 inches away from the graphics – Do not burn or melt them! Place the decal, with the backing paper still on, on your plastic. Line the graphic up from left to right. Hold your decal in place by taping the top and bottom of the decal at its center to the plastic. Peel half of the backing paper away from the graphic until you reach the middle. Cut the loose backing paper off and re-check your alignment. Place graphic on the plastic without applying pressure at first – Make sure the graphic is still in the right place using bolt holes and cut outs as reference points before applying pressure. Once you have the first half of the graphic in the correct place begin to apply pressure using your thumb or a squeegee. Work from the center to the outer edges. We recommend working in small sections starting at the center and applying pressure “across and down” first, then “across and up”. Be very careful to avoid wrinkles or bubbles. If you notice any bubbles carefully peel up the section and start again. Don’t be afraid to peel up corners and adjust the graphic. A little heat will help this process. Remember to work from the center to the edges of the graphics. Repeat the process on the 2nd half of the graphic. If needed – cut off any excess decal that cover bolts, access holes, or vent slits. Some aftermarket plastics and large gas tanks will need modification. When you have finished applying your graphics, warm them up at the edges and the “high ware” areas (where your knees and boots rub). This process should take 15 to 20 minutes. DO NOT OVERHEAT. Allow 24 hours for your graphics to set. After the 24 hours it is a good idea to go over the graphics once more before you ride to make sure all the edges are down. Take your time and be patient! This can be a long process. Clean your plastics with rubbing alcohol – even/especially if they are brand new. Use a heat gun or hair dryer especially on the complex curves. Hold the heat gun at least 12’’ away. DO NOT OVERHEAT OR BURN YOUR GRAPHICS. It is helpful to apply graphics in a warm location. If you decide you don’t like to install your graphics – Order them with the plastics next time. We’ll install for free.